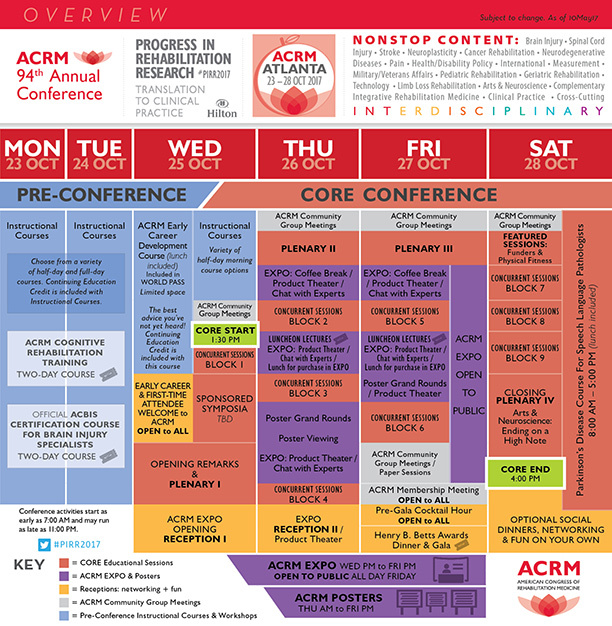 The ACRM Annual Conference, Progress in Rehabilitation Research (PIRR) is comprised of the main CORE Conference and the Pre-Conference delivering SIX jam-packed days of evidence-based educational content. Build a diverse personal itinerary by selecting educational sessions from any of the following focus areas, or choose 3 days of NONSTOP content focused on a single diagnosis. YOU pick the content that’s right for you. *Scheduling is subject to change. See the Conference App for full details.